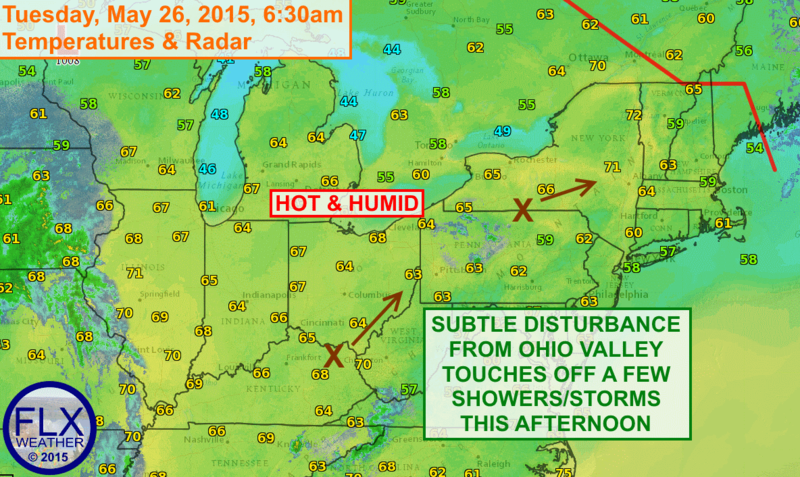 A hot and humid day is in store for the Finger Lakes with temperatures starting the day in the mid and upper 60s. High temperatures should easily push into the mid 80s for most of the Finger Lakes by the early and mid afternoon hours. A few of the normally warmer locations in the northern Finger Lakes will push towards the upper 80s as well. 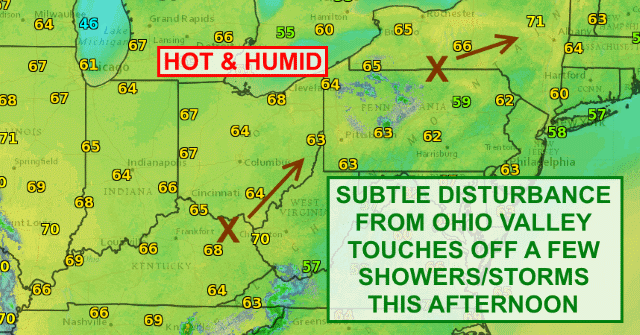 With dewpoints in the mid and upper 60s, some heat index values will approach or even slightly exceed 90º. Despite the hot and humid conditions, the atmosphere will be relatively stable this afternoon thanks to plenty of warm air throughout the atmosphere. Still, as a weak disturbance lifts northeast from the Ohio Valley, a few showers and possibly a thunderstorm or two will probably develop this afternoon, mostly after 4pm. The best chance for rain appears to be over the Southern Tier and into the eastern Finger Lakes, though most of the region has at least a small chance of seeing some of these showers. For the most part though, any rain that does fall will be fairly insignificant. There will be another chance for showers and thunderstorms on Wednesday, though it is tough to say at this point where the best chance may be. There are at least some indications that the immediate Finger Lakes region will not be in a favorable spot for rain, with showers more likely to our west over Canada and to our east over Eastern New York. More details on this Wednesday morning. Thursday and most of Friday look dry, but still rather warm, especially on Thursday.